The “Dispose My Meds Program”is being launched in an effort to confront and halt the growing environmental threat of discarded pharmaceuticals finding their way into our bays, estuaries and landfills. 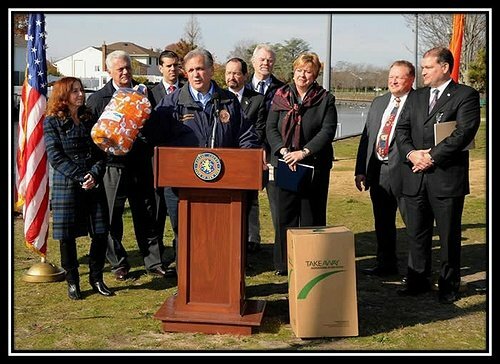 Nassau County, NY - November 14th, 2014 - Nassau County Executive Edward P. Mangano was joined by New York State Senator-Elect Michael Venditto, Oyster Bay Town Supervisor John Venditto, Hempstead Town Supervisor Kate Murray, United Water, the Citizens Campaign for the Environment, King Kullen Supermarkets and Operation SPLASH at a press conference earlier today at John J. Burns Park as they launched a Long Island wide consumer driven “Dispose My Meds Program.” The program is being launched in an effort to confront and halt the growing environmental threat of discarded pharmaceuticals finding their way into our bays, estuaries and landfills. Studies over the last decade have detected pharmaceutical compounds in treated wastewater effluent, rivers, lakes, and ground water throughout the nation. According to the United States Geological Survey (USGS), over 80% of waterways tested in the nation show traces of common medications such as acetaminophen, hormones, blood pressure medicine, codeine, and antibiotics. Working in cooperation to meet the challenge, United Water will provide King Kullen customers with pre-addressed, postage paid envelopes which they can fill with expired or unwanted medications. All the customer needs to do is drop the envelope into the nearest mailbox to ensure safe disposal and thereby participate in a program that further protects our environment. The effort has the additional benefit of eliminating surplus medications that too often fall into the wrong hands that, in turn, aggravate the region’s drug abuse crisis. This initiative follows the successful introduction of Prescription Drug Disposal Bins at Nassau County Police Precincts and Policing Centers by County Executive Mangano in February of 2012. To date, nearly 13,000 pounds of pharmaceuticals have been collected in these bins. Richard Henning, United Water’s Senior Vice President for Communications, stated, “It is established science that a continuous exposure to low levels of pharmaceuticals can harm aquatic communities and ground water. Long Island is particularly susceptible to this double threat and we need to expand and strengthen our pilot program that began to address this problem following its introduction last year. Subject: LongIsland.com - Your Name sent you Article details of "Mangano Launches “Dispose My Meds Program”"